Description: This National Park is made up of several amphitheaters carved from sandstone. The elements have shaped the sandstone into stone pillars. You can appreciate the odd scenery from trails and overlooks along the edge of the amphitheaters or you can hike down the trails and walk among the stones and pine trees. Location: Bryce Canyon National Park is located in the center of Southern Utah. 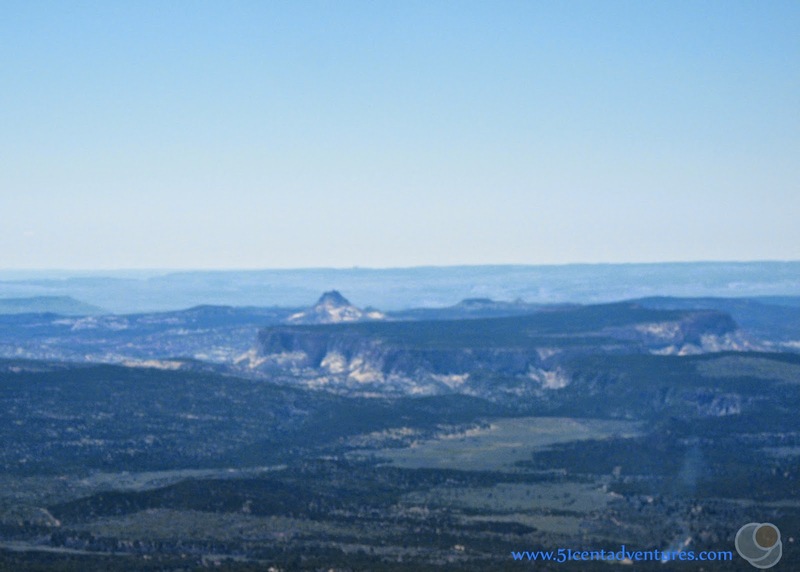 The nearest town of any size is Panguitch which is 30 minutes away. Bryce Canyon is about 90 minutes from Zion National Park, and 3 hours and 15 minutes from the North Rim of the Grand Canyon. Cost: The entrance fee is $25 per vehicle, and is good for seven days. Back country permits are required for over night hiking trips. They range from $5 to $15 depending on the size of your group. 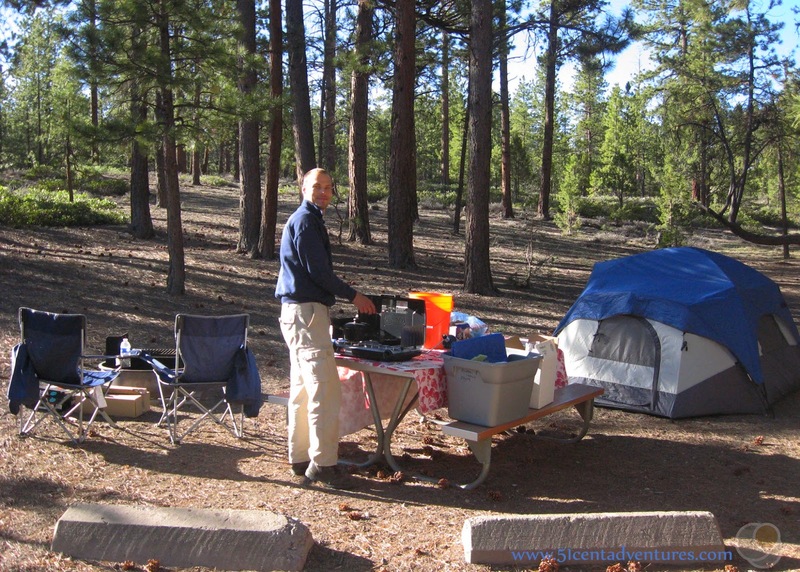 Camping at the developed campgrounds starts at $15 per night. Operating Seasons and Hours: The park is open all year long. However, since the park is located at 8000 feet above sea level it has snowfall into the late spring and starting in the early fall. Bryce Canyon National Park was the destination on the second day of the Southern Utah Road Trip that my husband and I went on in 2010. We left Zion National Park, passed through Red Canyon on Highway 12 and arrived at Bryce Canyon in the evening. It was late in the day so all we did was set up our campsite and make dinner. We had hiked to the top of Angel's Landing in Zion National Park earlier in the day, and so we didn't have the energy to do anything besides relax at our campsite. 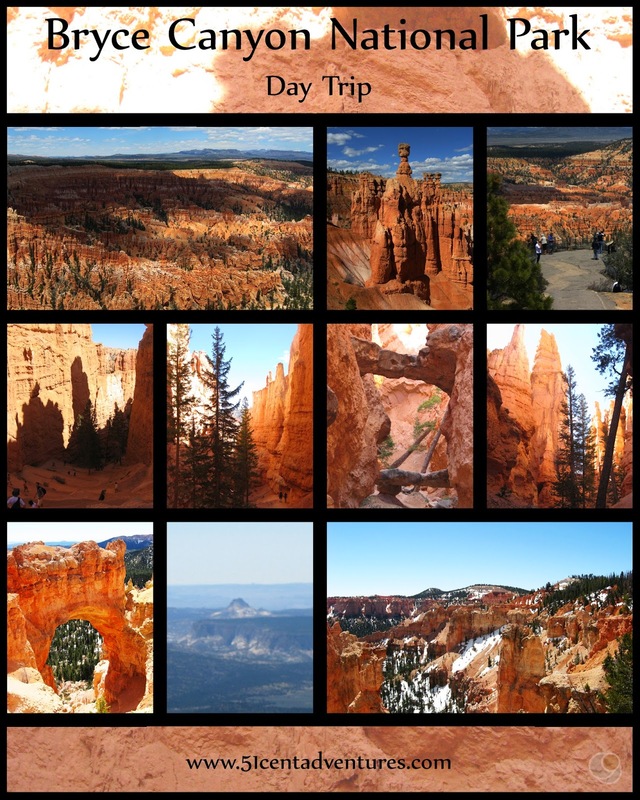 The next day we set out to see Bryce Canyon National Park. We could have spent several days in the park, but we were on a mission to see as much of Southern Utah as possible in only 9 days. That meant that we could only spend one full day in the park. That actually turned out to be just enough time. 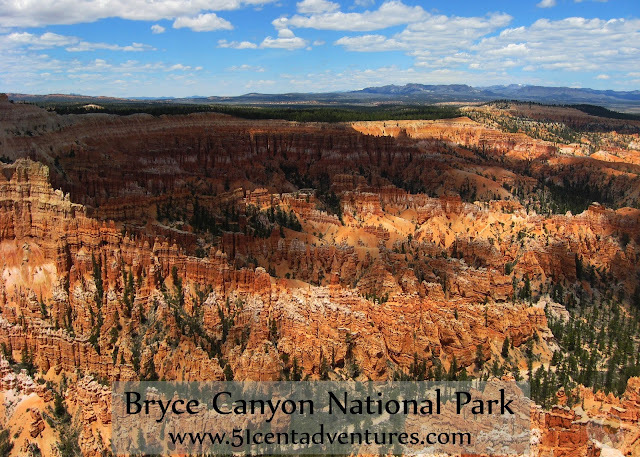 I'm going to share with you the things you can see and do in one day in Bryce Canyon National Park. Before we get too far I want to confess two things. 1. 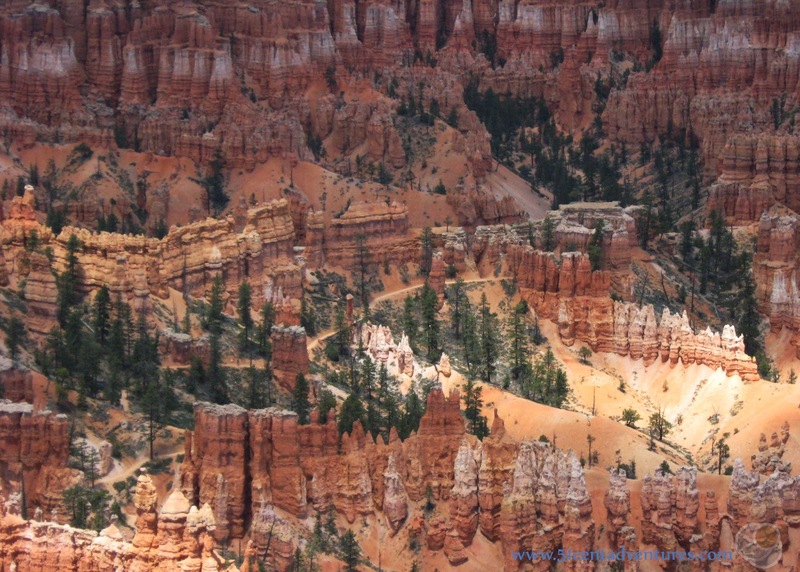 I didn't like Bryce Canyon National Park as much as I liked Zion National Park. After the towering red walls and flowing water in Zion National Park, Bryce Canyon was a little underwhelming. It had some interesting sights, but after a while all the hoodoos kind of ran together. 2. I've visited Bryce Canyon twice in my life and both times I feel like I did it wrong. Let me explain. When you enter the park the rangers will give you a map of the park. The map shows all of Bryce Canyon. On the map you can see Highway 63 which is an 18 mile road that stretches from the entrance station at the northern end of the park to Rainbow Point at the southern end. Along that road are several overlooks and areas of interest. When I visited Bryce Canyon with my family as a teenager we thought it would be a good idea to start our visit to the park by driving Highway 63 and stopping at every area of interest. It was a long tedious process that involved driving on a winding road, getting out of the car to glance at a vista, then get back in the car to drive 2 minutes to the next overlook, glancing at it and then getting in the car to do it over and over and over again. The sights were interesting, but compared to what we saw later in our visit it was kind of a waste of time. In 2010, when I visited the park with my husband, you'd think I would have learned from the last visit. But no. For some reason we did the same exact thing. We started out at Rainbow Point and worked our way back down Highway 63. By the time we got to the Bryce Amphitheater part of the park we realized that this was where all the really interesting features of the park were located. Looking back I wish that we had spent more of our time inside the Bryce Amphitheater area. This is the main part of Bryce Canyon. 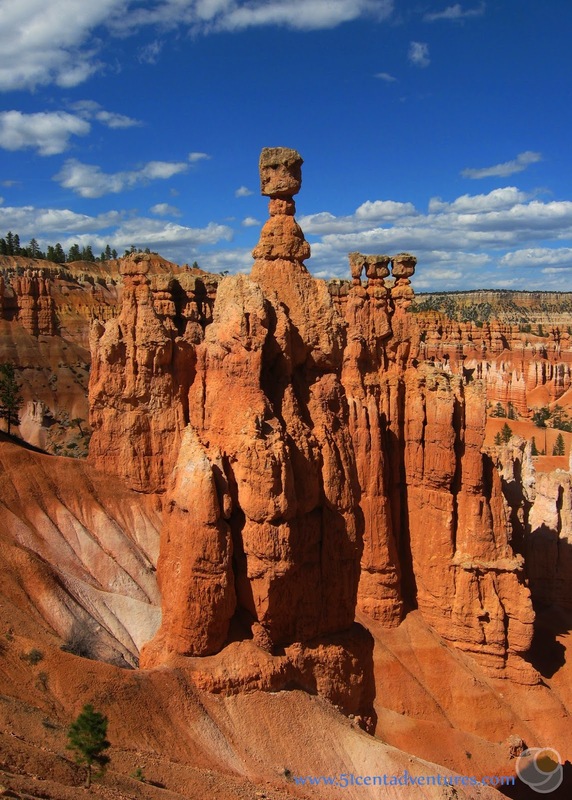 It has all the great jaw dropping vistas of endless hoodoos that you see on every postcard of Bryce Canyon. I don't think we would have missed out on anything if we had run out of time and hadn't been able to drive out to all the other overlooks along Highway 63. 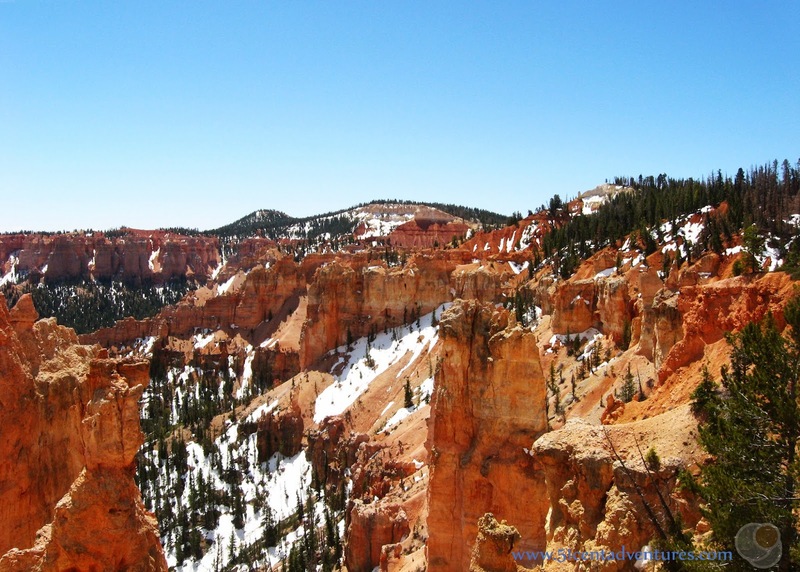 Here's how you should go sightseeing in Bryce Canyon. This isn't the way that I've ever done it. It's what I wish I had done. When you enter the park go directly to the Visitor Center, and find a parking place. Inside there are exhibits and even a 22 minute movie that plays on the hour and half hour. Oddly enough I've never been in the Bryce Canyon Visitor's Center. I don't know why I didn't ever go in there. It sounds like the type of place I would have enjoyed. There is a shuttle bus that makes stops around the main part of the park. You can catch one of the shuttles from the Visitor Center. 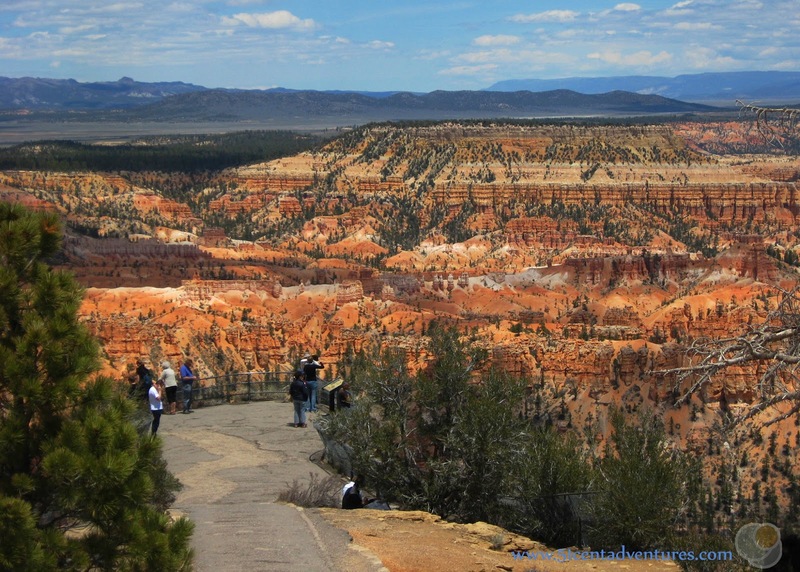 The shuttle will take you to various spots that overlook the Bryce Amphitheater part of Bryce Canyon. 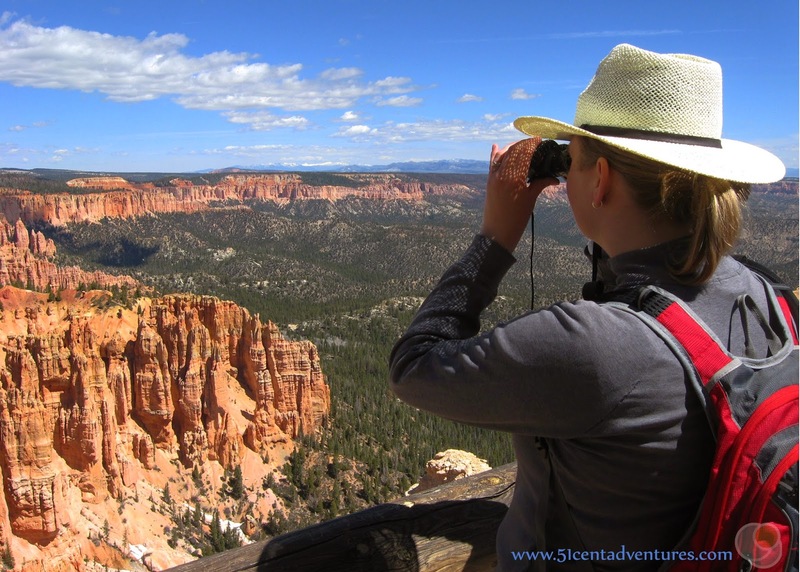 Every overlook will give you a great view of the quintessential look of Bryce Canyon. The most popular overlooks are Sunrise and Sunset Point. They are connected by an easy paved and level trail. One of my favorite overlooks is Bryce Point. The view from that overlook gives you a good look into Bryce Amphitheater. You'll have to walk from the shuttle stops to the overlooks, but everything is paved and there isn't much of an elevation change. If you don't feel like riding the shuttle, you can drive your own car and park at the parking lots at each overlook. However, the shuttle runs frequently enough that driving isn't any more convenient than riding the shuttle. After you've looked at Bryce Amphitheater on the large scale, it's time to experience it up close. 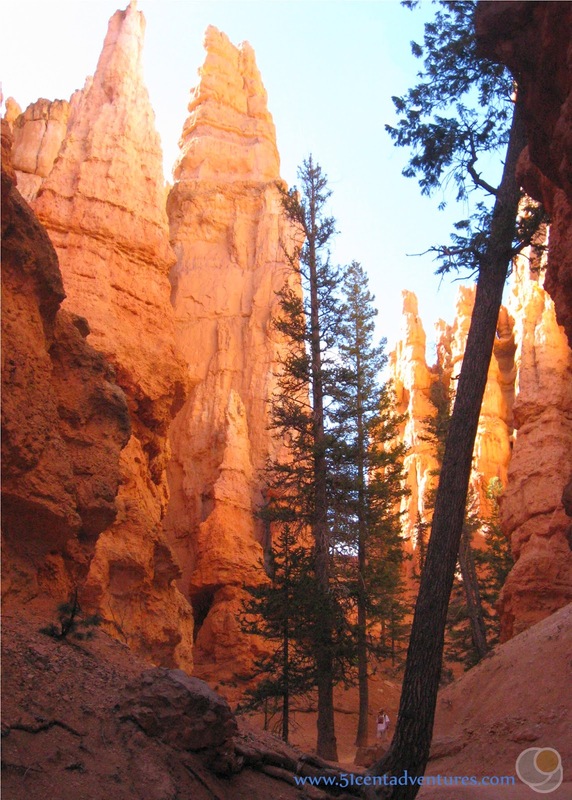 There are many trails that lead down into the canyons that contain hoodoos. The Navajo Loop trail is one of the best. The trail begins at Sunset Point. 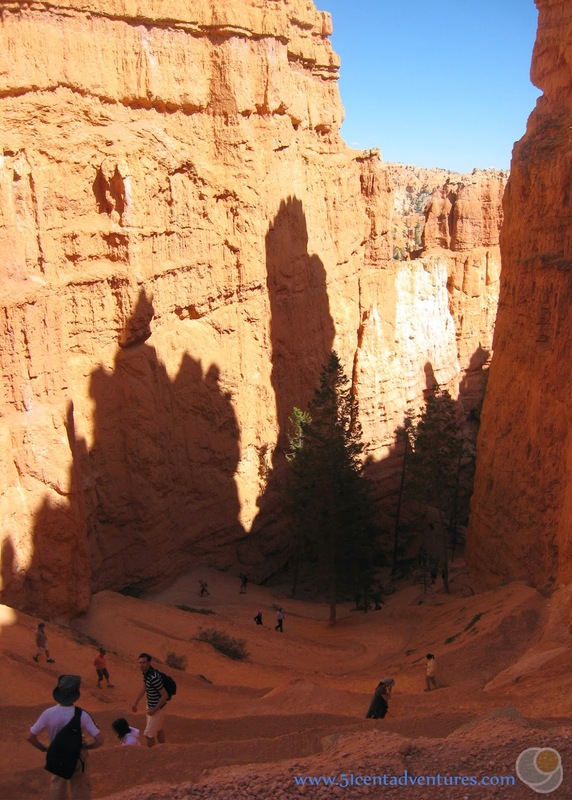 Before the trail goes too far you will see one of the iconic hoodoos of Bryce Canyon - Thor's Hammer. Then the trail begins it's many switch backs. One thing to keep in mind as you hike down the trail - you will have to hike back up. Don't assume that just because it's easy going down that it will be easy on the way back up. The slot canyon at the bottom of the switch back has many pine trees growing through it. This is probably my favorite part of Bryce Canyon. I love how close you can get to the rocks that make up the canyon. Hiking between the hoodoos really gives me a sense of how big everything is. The slot canyon opens up to a forest of pine trees. The trail goes through this flat area before looping around and ascending up a different canyon. We didn't have time for it on this trip, but one day I would like to hike the 23 mile long Under the Rim Trail. As it's name suggests this trail is under the rim of all the overlooks and runs the length of the park. 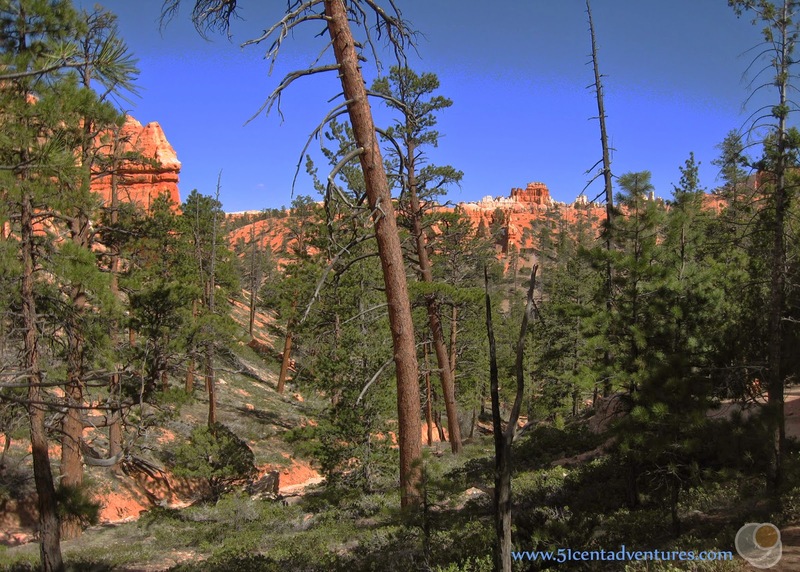 After you've had your fill of the Bryce Amphitheater part of Bryce Canyon you can venture out to explore the outer areas of the park. All the areas of interest are located on the eastern side of Highway 63. Here's a little hint: If you start at the northern end of the road and work your way south you will be making left hand turns every time you try to stop at an overlook. The smarter way to visit all the view points, is to drive all the way to Rainbow Point at the southern end of Highway 63. Then you will be able to make right hand turns into and out of the parking lots for all the view points on your way down the road. 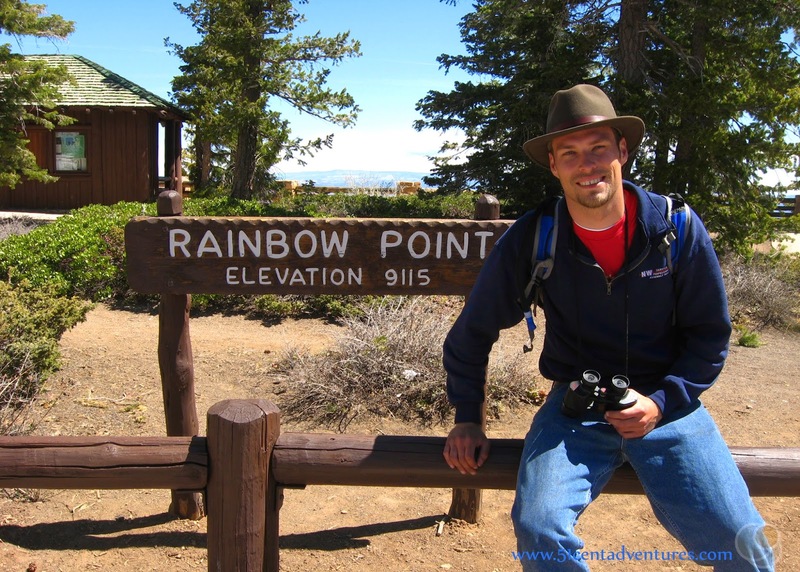 Rainbow Point is the highest part of the park. It is 9115 feet above sea level. Because it is so high it is very cold. Our visit was in May and we needed jackets up there. But don't be fooled into thinking that the cold air means you don't need sunscreen. The air is thinner which means there is less atmosphere shielding you from the sun. So make sure that any skin that isn't protected from the cold is protected from the sun. The view from Rainbow Point is spectacular. You can see all the various amphitheaters that make up Bryce Canyon. While we are on the subject, Bryce Canyon isn't really a canyon. Instead it's a collection of amphitheaters that have been carved into a plateau. The misnomer originated when the pioneers settled the area and has stuck around to this day. If you look off into the distance you can see hills that appear to be the remnants of ancient volcanoes. Rainbow Point was so high that there was still snow around some of the hoodoos. We stopped at many other overlooks on our way back down Highway 63. I honestly couldn't tell you anything in particular about any of them. If you are pressed for time, the only feature of note is Natural Bridge. In keeping with Bryce Canyon's mis-named feature tradition this is really an arch and not a natural bridge. Natural bridges are formed by water flowing under them - this one was not formed that way. Natural Bridge is easily viewed from the overlook next to the parking lot. Our next night we spent in a tipi at the Ruby's Inn Campground. Ruby's Inn is actually a pretty interesting attraction that is worth checking out even if you aren't staying there. It is located just outside the entrance of Bryce Canyon. It even has it's own shuttle stop. In addition to the hotel and campground, Ruby's Inn also has a gift shop, a general store, and a rock shop. The Inn provides equipment and guides for activities such as horseback riding, ATVing, mountain biking and more. 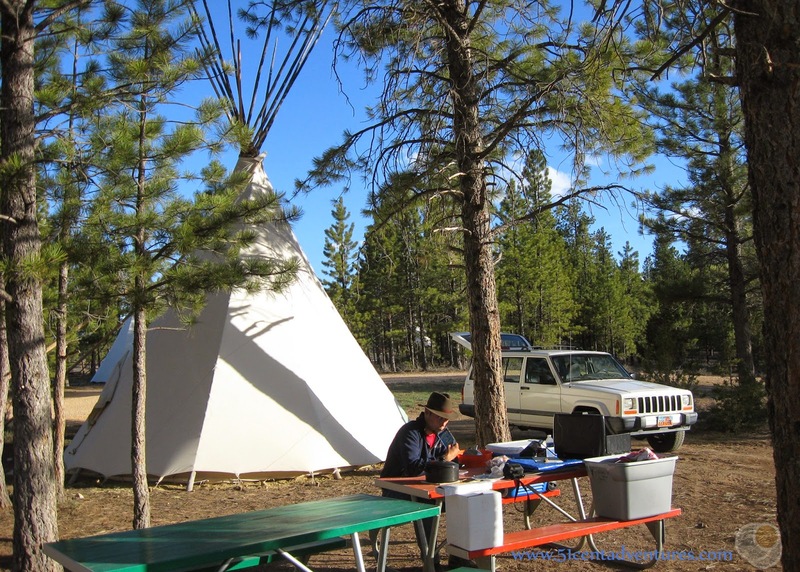 A teepee wasn't our only option for where to stay at the Ruby's Inn Campground. We could have stayed in a cabin or camped in our own tent or RV. 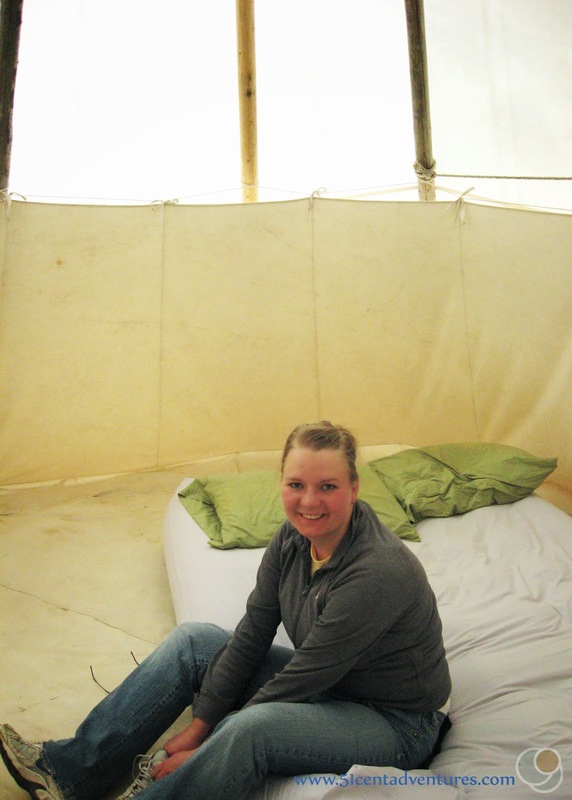 However there was just something magical about the idea of sleeping in a teepee. We had access to Wifi which I thought was pretty funny granted we were in a teepee. Our bathrooms had nice hot showers. We also had access to the Ruby's Inn pool. During the summer season we would have been able to use the campground's outdoor pool, but it was still too cool for that. Instead the staff gave us the code to access the pool inside the Ruby's Inn Hotel. We went swimming the morning of the fourth day of our road trip. That was a fun way to start out the day. 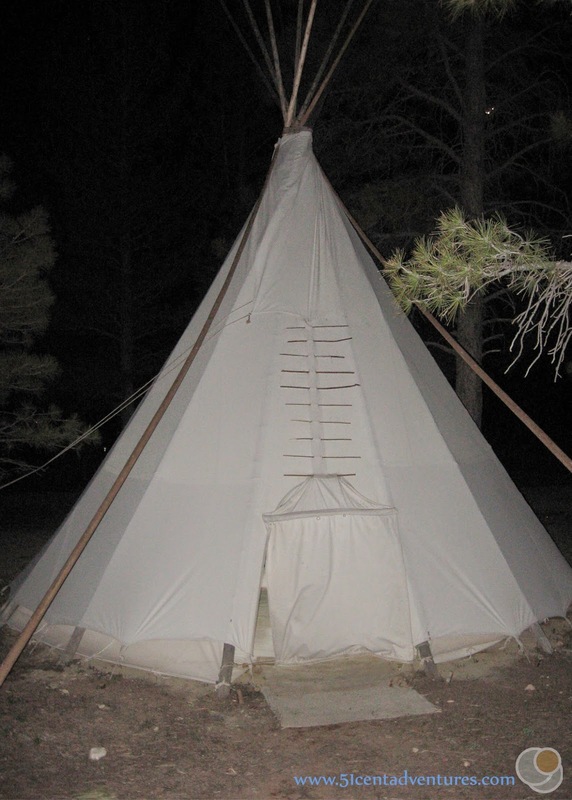 I'd slept in a teepee before at a camp that I attended at BYU-Idaho as a teenager. That teepee had bark chips on the floor and a large gap that let bugs into the tent. The teepee at Ruby's Inn had a large canvas that covered the floor and stretched up the sides of the teepee. It was nice to know that we wouldn't be visited by bugs during the night. There is one more place within the vicinity of the park where you can stay the night. However, this one is definitely not in the 51 cent adventure price range. 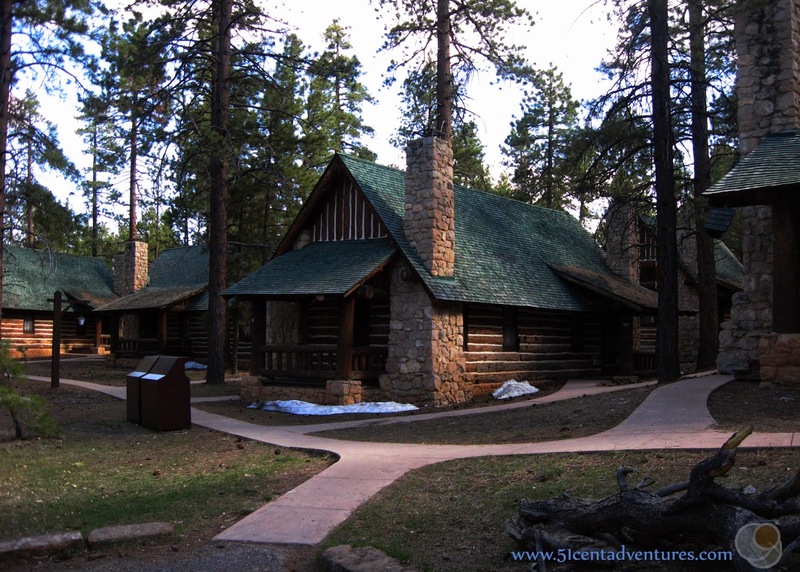 The Lodge at Bryce Canyon is located just west of Sunrise Point. You can either stay in the lodge or in cute little rustic cabins. Imagine waking up and being able to walk a few yards to the rim of Bryce Amphitheater. That kind of convenience comes with a steep price tag though - even the "cheap" rooms start at over $150 per night. Regardless of where you stay you should be prepared for the cold. The lower parts of Bryce Canyon are at 8000 feet above sea level. To put that in perspective, Salt Lake City is about 4300 feet above sea level. Denver is 5280 feet. Santa Fe, New Mexico, the highest capital city in the United States, is at 7200 feet above sea level. 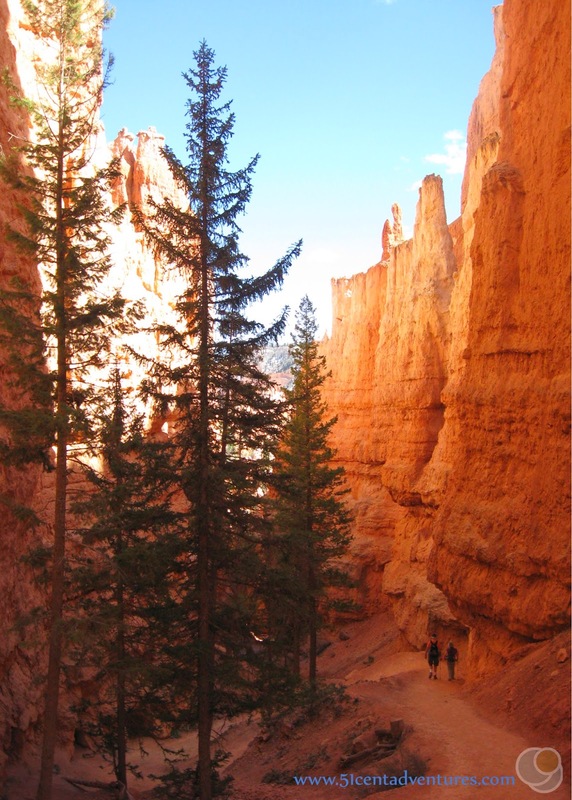 Chances are the elevation at Bryce Canyon will be higher than where you normally sleep. That means that no matter what time of year you come to the park it will be colder than what you are used to at night. During our stay in May the temperature got down to the low 30s. We had four sleeping bags - two under us and two on top of us. I shivered the entire first night because we had our plastic-lined sleeping bags as the inner bags. The next night I switched the bags so the flannel-lined bags were the inside ones. That change made it so I was just cold instead of freezing. Even though I didn't like Bryce Canyon as much as Zion National Park, doesn't mean I didn't enjoy my time there. The area is very unique and the scenery is impressive. It's one of those places you should definitely visit if you can. Recommendation: You should plan a trip to visit Bryce Canyon National Park. But make sure you plan to visit it the right way. 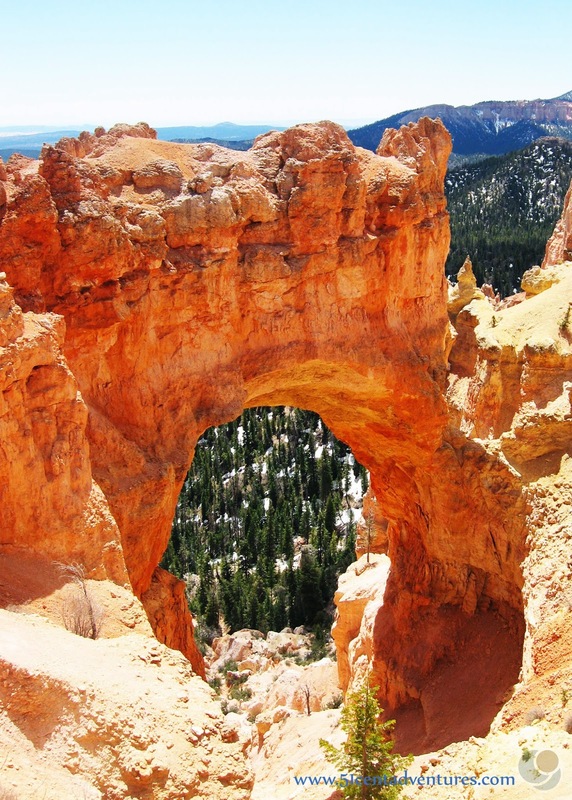 Directions: Most travelers will access Bryce Canyon from Utah's Highway 89. Travel to Panguitch, Utah on Highway 89. Then turn onto Highway 12. Travel on Highway 12 for 13 miles. Then turn left onto Highway 63. After 4 miles Highway 63 will lead you directly to the entrance station for the Bryce Canyon National Park. 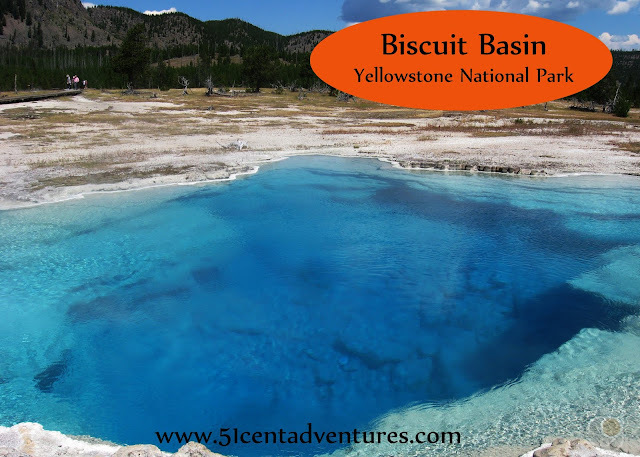 Places nearby: Kodachrome Basin State Park is 24 miles to the east of Bryce Canyon. If we had more time in our schedule we would have stopped here to at least take a look. The link for the that state park's website is: http://stateparks.utah.gov/park/kodachrome-basin-state-park. We spent our honeymoon hiking all over Bryce Canyon, so it will always have a special place in my heart. It's also a great place to stay in the winter and explore on cross-county skis. I second Ruby's Inn as a great place to stay or camp because of the amenities.